Farmers have an in-depth knowledge of the physical properties of their fields. Proximal sensing and airborne data are just examples of recent technologies that provide high-resolution insight about the intra-parcel variability. Geostatistics takes benefit of such data and allows refining precision agriculture practices. Exploratory data analysis first allows identifying and handling data anomalies and anisotropies using appropriate statistical representations: basemap, histogram, q-q plot, variogram map, logs, 3D viewer. The analysis of the spatial distribution of the variable of interest is based on a spatial correlation function calculated from the sample measurements and known as the variogram. 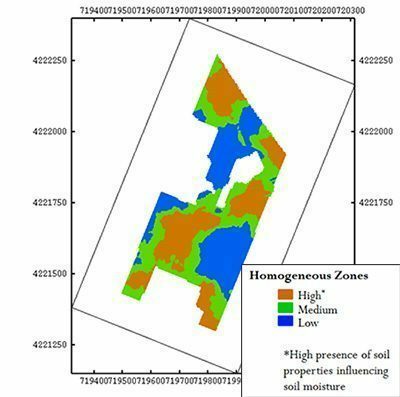 The relationship between the soil data and auxiliary information may also be investigated in order to improve the understanding of the spatial dynamics of soil properties. Data integration is at the heart of precision agriculture. Indeed, as defined by the US National Research Council in 1997: “Precision agriculture is a management strategy that uses information technologies to bring data from multiple sources to bear on decisions associated with crop production”. Geostatistics provides a full range of methods dedicated to the integration of auxiliary data during the mapping of key variables such as yield or soil properties: cokriging, collocated cokriging, external drift kriging, bayesian kriging, kriging with varying local means, etc. Variogram analysis allows identifying different scales of variability for the soil properties. Such scales may be related to farming practices or geological trends. Once identified these different scales, geostatistics provides a solution called factorial kriging that aims at extracting spatial components of particular interest from the overall measured information. This method aims at filtering out components of limited interest or analyzing separately these components.